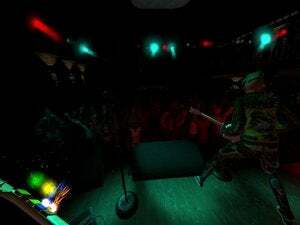 When last we saw Rock Band VR back at GDC it was essentially just the obvious ”Rock Band in virtual reality.” Put on the Oculus Rift and you’d see yourself on stage, guitar in hand, adoring crowd staring up at you in rapt anticipation. The familiar “Note Highway” would appear at the foot of the stage, and you’d play a song. So Harmonix decided to go a different direction. That’s what we saw at PAX this weekend, holed up in a hotel meeting room. What the team’s essentially done is taken the freestyle guitar solos from Rock Band 4 and fleshed them out to entire songs. In Rock Band 4, Harmonix changed guitar solos from a complicated set of licks to a more performative system where any button you played, you’d sound good. You could play fast, you could play slow, and it’d always be in key—the important part. It was a bit more like playing a real guitar solo, though the tradeoff for Rock Band purists was that it made the game less skill-based and less points-driven. And if you’re that type of super-technical Rock Band player? 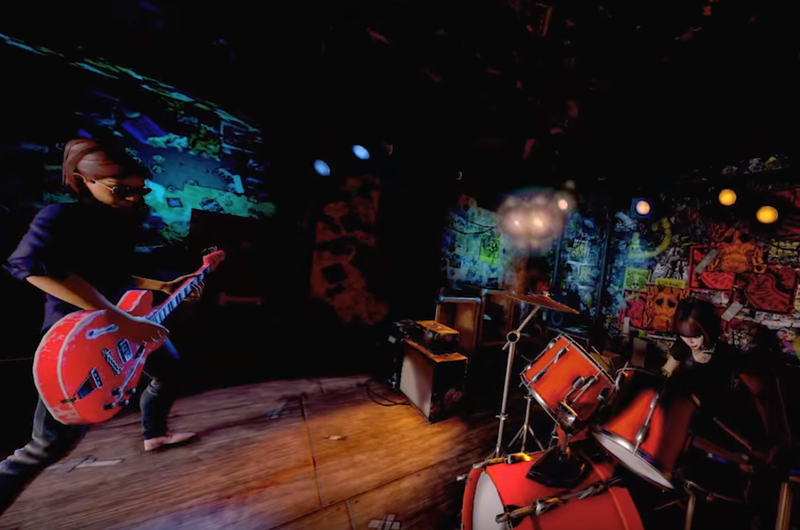 Well, you probably won’t like what’s been done with Rock Band VR. Harmonix has ditched the note highway entirely, at least in the default mode of Rock Band VR. I confirmed that you could turn it back on and—presumably—stick with the old foot-of-the-stage note highway design. We’ll take a look when the full game releases. There’s a skill-based portion to this—different button combinations represent different chord types, and playing them at specific times or playing various patterns will net you score multipliers. Two buttons side-by-side? Muted power chord. Two buttons with a gap in between? Regular power chord. And so on. The point though is that you can make music without really needing to pay attention to any one thing. The “suggested” chord shapes appear on the guitar’s headstock if you’re going for score, but Rock Band VR is more concerned with the feel of being on-stage. And it works, at least in the realm of a fifteen minute demo. I played through Van Halen’s “Panama” and Bon Jovi’s “Livin’ on a Prayer,” and it’s freeing to not have to stare at the damn note highway. You can better appreciate the fact that you’re really on-stage! Playing a show for people with weirdly big heads! They’re all cheering for you! You can look over at the drummer, noodle around with the bassist, or get right up in front of the stage and play guitar into the faces of your fans. Hell, you can even do Angus Young’s weird little trot-squat move and trigger overdrive (instead of lifting the guitar neck). It’s dumb, it’s fantastic, and I’m so happy Harmonix thought of it. 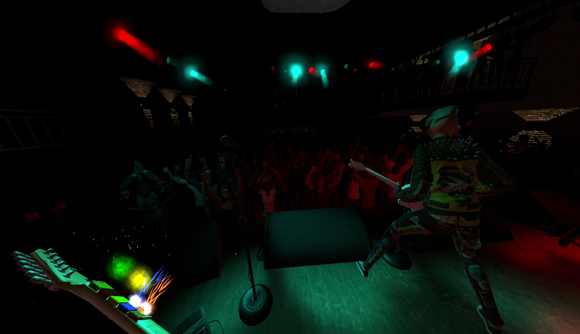 Rock Band VR is concerned with presentation, with the experience. And that’s a pretty good place for a virtual reality game to start from, not slavishly porting old features into a medium that doesn’t work. My worry at the moment however is that it’s a great VR demo, maybe not so great once the novelty wears off. I’m a big Rock Band fan, but part of the draw was playing with friends. That’s gone in Rock Band VR, since it’s just guitar. The other draw, and the thing that convinced me to sometimes play alone? The skill portion. Getting better at a riff, running it over and over until you could nail it note for note and see your score at the end. That, too, is mostly gone in Rock Band VR. You can chase score with the new chord system—Harmonix made sure to tell me that many, many times during my demo—but it doesn’t provide the immediate feedback or satisfaction of nailing a riff on the note highway. There is a story mode in Rock Band VR though, and that could be the game’s saving grace—something to convince you to keep playing even once the “Oh, I’m on stage!” glee runs out. Rock Band 4’s career mode was pretty hilarious, and I’m hoping Harmonix can bring that spirit and creativity over to VR. There’s a lot that could be done to make you feel like you’re living that rock star lifestyle from the confines of your living room. One last thing I think’s important to mention: You’re going to want some real speakers for this one, or some decent standalone headphones. I’ve been impressed with Oculus’s built-in headphones—they’re convenient, and put out pretty decent sound considering their size. But for concert-style music? Not good enough. Harmonix had music playing through normal desk speakers too, and it made a world of difference. Despite some compromises, I’m still excited. Rock Band VR is one of the more creative applications I’ve seen for the as-yet-unreleased Oculus Touch controllers, and it’s one hell of a Touch launch title—Rock Band on the PC! At last! Whenever Touch finally launches, I guarantee I’ll be spending a fair few hours in my rock star persona. Hopefully I don’t develop a crippling virtual heroin addiction at the same time.